Posted on April 4, 2019 , in Saunas. Saunas raise both your skin and body temperature which causes you to perspire while also increasing the heart and circulation rates. But how hot does a home sauna get? It really depends on the type of sauna you’re using. 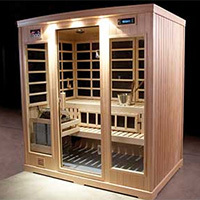 There are three main types of sauna: traditional, infrared and steam saunas. In this article, we’ll go over each type as well as the temperatures that they normally reach. As a side note, there used to be a World Sauna Championships in Finland where competitors would find out how long they could last in 230-degree Fahrenheit (110 degrees Celsius) heat. Although this is a much higher temperature than found in most traditional saunas, some people have been known to spend a few minutes in saunas with temperatures as high as 285 degrees Fahrenheit (140 degrees Celsius.) Such people also typically wear felt caps and slippers to help deal with the high temperatures. But after a competitor died in 2010, the World Sauna Championships were suspended. Due to their lower temperatures, infrared saunas provide a much different sauna experience than traditional saunas. For those who can’t handle high temperatures, infrared saunas may be ideal. For those who are used to the high temperatures found in traditional saunas, an infrared sauna will be a different experience. Because of the lowered temperature in steam saunas, they may be more comfortable for some people. However, the humidity can be less comfortable for those not used to high humidity. It really comes down to personal preference. Make sure to download this month’s promotions to save on home saunas.